It’s no secret that dogs and cats are both hard on your flooring. 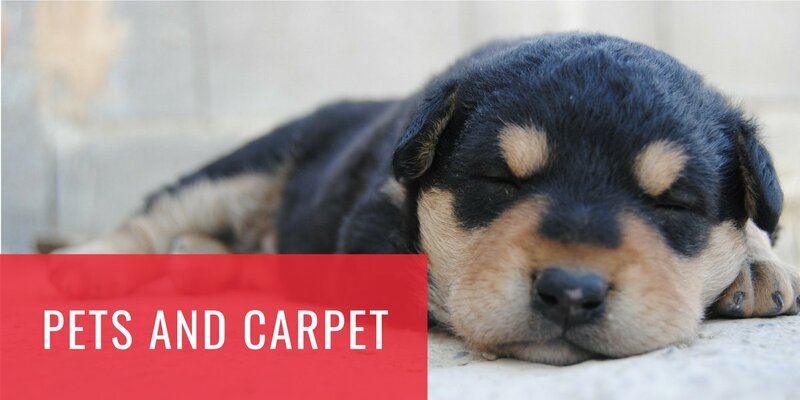 They can track in dirt from outside, the oils that protect their skin can rub off onto the carpet where your pet likes to lay causing stains and dirt buildup, and their claws can get snagged in the carpet. For these reasons, you’ll want a carpet that is very durable but can also hide dirt in between regular vacuumings. Stay away from a loop pile, or Berber, carpet to avoid your pet snagging on the loops, especially if you have a large dog. Carpet that has one or more colors in it can help to hide dirt and prevent your carpet from looking dingy. Pet accidents are one of the hardest odors and stains to get out of your carpet. Choosing a carpet fiber, like nylon, that is resistant to stains as well as a waterproof carpet padding can help to prevent stains and smells from getting trapped into the fibers. You’ll want to stay away from easily staining carpets, like wool. With the additional wear and tear on the carpet, it is essential to have a good vacuuming routine in place that will help to keep your carpet in good condition. When dirt and debris get caught in the carpet fibers, it will degrade the carpet faster and cause it to look dingy quickly. At least once a week vacuuming will help to prevent this. If your pet has an accident, the best way to prevent odors and staining is to clean it as soon as possible by first removing the liquid and then using a carpet cleaning solution designed for pets. There are many great pet-friendly carpets out there. Here at Carpet Depot, we want to help you make the best decision for your home, family, and budget.